Roughly one week removed from San Diego Comic-Con International and news continues to dribble out. 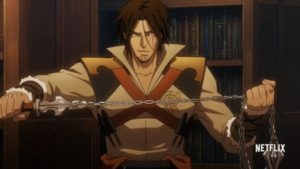 The latest tidbit to rock fandom is the trailer for the second season of Castlevania. Roughly adapting Castlevania III: Dracula’s Curse (1989), the story follows Count Dracula trying to sink the world in darkness and four heroes rising up to stop him: vampire killer Trevor Belmont, young witch Sypha Belnades, dhampir Alucard, and thief Grant Danasty. The first prequel produced for the Castlevania series, Dracula’s Curse is situated early in the property’s timeline which provides a wealth of material for the series moving forward. Its second season dropping all at once on October 26th on Netflix, the second season will be twice as long as the first at eight episodes. Lets take a look at some characters revealed in the new trailer.